For months, national anti-fracking activists have used and abused the Colorado Oil and Gas Conservation Commission (COGCC) hearings process to capture media attention, deploying various political stunts to gain headlines. So it came as a welcome surprise last week when the activists were noticeably absent from the COGCC flowline rulemaking hearing. Instead, the meeting proved to be a collaborative one, including input from a broad range of stakeholders including environmental groups, local governments, agriculture, and the oil and gas industry. The hearing was part of a process, which began back in September 2017 at the request of Governor John Hickenlooper (D-CO) in accordance with the governor’s August 2017 announcement of a seven-pronged approach following review of oil and gas operations that directed the state’s regulatory authority, the COGCC, to review and strengthen existing flowline rules. Energy in Depth was at the two-day COGCC rulemaking hearing, and here’s a recap of what you need to know. During the public commenting period, there was a strong turnout from Colorado’s business community to show support for industry as the COGCC worked to finalize new rulemaking. Supportive groups included the Colorado Farm Bureau, South Metro Denver Chamber, Vital for Colorado, Colorado Alliance of Mineral and Royalty Owners, Colorado Business Roundtable and the Denver Metro Chamber of Commerce — just to name a few. Though these groups came from a variety of backgrounds and viewpoints, they all made clear the important role energy and local energy development plays in their own operations. Groups like Colorado Farm Bureau emphasized how vital it is for Colorado farmers and ranchers to have access to “domestic energy production through lower-priced oil, natural gas, and electricity” since growing and distributing food is such an energy intensive industry. 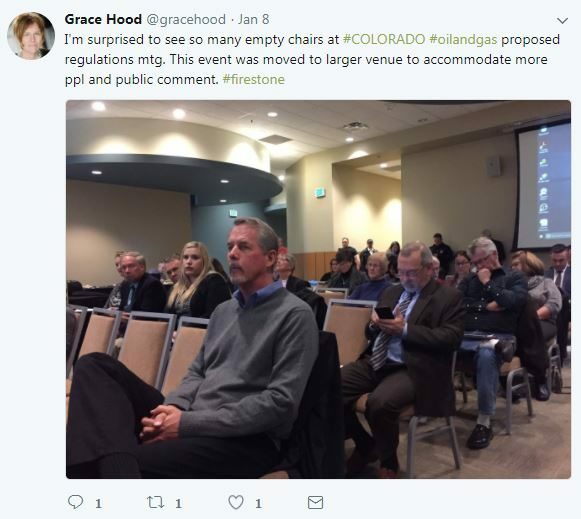 The lack of the usual political theatrics by national anti-fossil fuel groups caught the attention of reporters like Colorado Public Radio’s (CPR) Grace Hood, as noted in her tweets from the hearing. That didn’t stop some reporters from insisting that there was greater opposition to oil and gas than there was, of course. To be expected, there were a few of the usual suspects in attendance, including State Senator Matt Jones (D-Louisville), and groups like League of Oil and Gas Impacted Coloradans, Oil and Gas Accountability Project, and affiliates of the national activist organization Earthworks. Of note, La Plata County Commissioner Gwen Lachelt addressed the COGCC briefly, not as commissioner but as “myself and on behalf of the Fitzgerald’s and not the La Plata County Commissioners.” For background, the Fitzgerlad’s Lachelt is referring to is Terry Fitzgerald and her husband Jim who are featured on the Earthworks website. This disclosure is noteworthy given that her hometown newspaper, the Durango Herald, recently raised concerns in an editorial about her serving as both the head of an environmental group and as a county commissioner at the same time. In this instance, she seems to be back to speaking on behalf of the Oil and Gas Accountability Project, another environmental group she launched before she became a county commissioner, but it’s hard to keep track. No doubt, her testimony will likely raise some eyebrows. The above clearly outlines 811’s mission and the important role the 811 program plays in public safety. Recall that 811 is an existing state law in Colorado that requires oil and gas operators, along with any other utility owners, to be a member of 811. 811 holds a database of all utility lines running underground and uses this information to connect a caller, a local government, builder, homeowner, interested in excavating, to a facility owner in the area so that the facility owner can dispatch to the site and mark any utility lines on specific section of ground which includes telephone, cable, water, sewage, electric, and oil and gas. That stated, what role does 811 play in the COGCC flowline rulemaking process? Keeping top of mind the objective here, which is the governor’s August decree tasking the COGCC to strengthen the existing rules – the COGCC went to work and reviewed existing rules, and called on stakeholder input throughout the process. From that review, and with the input of stakeholders, the COGCC crafted proposed flowline rules that will further leverage the existing 811 program to require oil and gas operators in Colorado participate in the 811 program as Tier 1 members. A Tier 1 member of the 811 program works closer with 811 than Tier 2 members. These are some important questions to be considered in the mapping conversation. A chief concern among stakeholders and the COGCC is that maps on the COGCC website could pose a risk to public safety in that many may rely solely on old or out-of-date information before digging in their yard, instead of contacting 811 directly, as they should under the current system. After two days of public comment and stakeholder input, the COGCC decided to delay a vote on the proposed rules until mid-February. In its current form, the proposed rules would expand upon the actions already taken by the oil and gas industry as part of the recent Notice to Operators that required documentation and inspections of equipment and flowlines across the region, as well as building upon existing rules of flowlines to include more flowline testing, more reporting, more monitoring and mapping by which operators will provide the COGCC with maps indicating start point and end points of flowlines. No doubt, the Colorado oil and gas industry is an important economic driver. With such a heavy weight to bear, and as these rules come to a final vote next month, industry has and will continue to put safety of workers and the public at the forefront of its operations as well as keep that top of mind in its stakeholder role in the COGCC flowline rulemaking process.